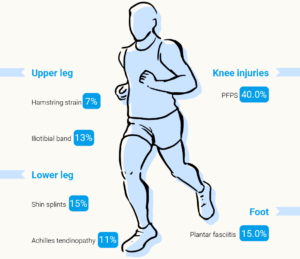 Loading forces/stress on the leg of each stride during running is 2.5-3x body weight, there is an 79% chance of experiencing at least one injury per year. 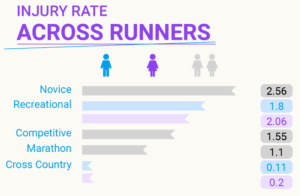 Literature has identified that 80% of running injuries come from overuse (a mismatch between the resilience of soft tissues and running load) and that nearly 50% of novice runnier who experience an injury, wont return to running again. Overloading tissues due to constant repetition of the running action. Watch your mileage, you should aim to increase your weekly mileage by no more than 5-10%. Include recovery days and cross train. Run on different routes and surfaces (including grass) to vary the repetitive nature and load on your body. You should also rotate between 2-3 pairs of different running shoes. Group runs are great for motivation, fun and company but ensure you can run at your pace within the group and don’t get dragged off on long, or hilly, runs if you are not ready. The way you run, or your running ‘style’ is very relevant. We all know that some people look fantastic while others look dreadful. However how you look does not relate to how ‘stressful’ or efficient your action is. Style can be difficult or even impossible to change so always consult a coach or a therapist with experience of working with runners. Running places stresses on the body. If given adequate time to recover these stresses will act as a stimulus causing the body to adapt in a positive manner making it fitter and stronger. However, if there is inadequate time between training sessions the body does not fully recover and minor damage to tissues can consequently develop into an injury. Hard training causes depletion of muscle’s glycogen stores. Muscle glycogen is an essential fuel during strenuous exercise, the depletion of it causes fatigue and inhibits performance. If glycogen stores are not effectively replaced, you will start the next run in a semi-depleted state, causing potential fatigue and therefore increased injury risk. The same may also be true of dehydration and fluid replacement after exercise. This overlaps with posture and anatomical factors (like being ‘flat footed’ or having knock knees). We adopt stressful postures daily, particularly when sitting, where imbalances in muscles can develop. Static positions held for long periods, or jobs that may lead to an overdevelopment of some muscles, and underdevelopment of others, create imbalances between abnormally tight and shortened muscles, or weak and long ones. This will alter movement patterns and postural control which can increase the potential for injury. A physical or manual therapist can be a great help in this situation. One of the strongest risk factors for injury is a previous injury in the past 12 months. Ideally therefore you want to prevent the first injury! If not, then ensure your injury is fully treated, healed and rehabilitated before you start a progressive return to running to avoid re-injury. 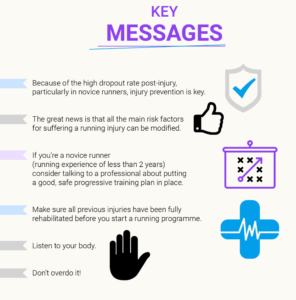 Even if you don’t feel pain from the injury, you may need to continue your rehabilitation treatment for some time after the injury has ‘healed’. Weak muscles are more prone to injury and less resilient to the impact forces of running. Focus on fundamental strength exercises. For runners, single leg strength is key. When you’re running, you are never on both feet at the same time. Each leg needs to be strong enough to absorb the ground reaction forces, which are about 2.5-3 times your body weight, during the landing phase. Mobility – or the ability to effectively move through a full range of motion — is key to a healthy body. Running causes scar tissue and muscle adhesions to form, which reduce your mobility and negatively impact your stride. 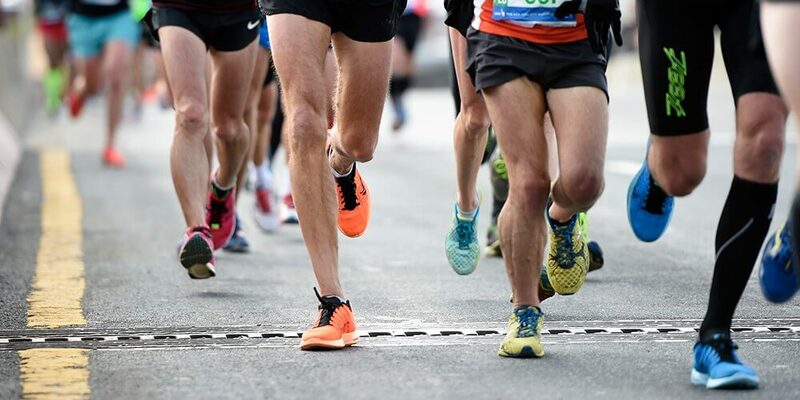 A large proportion of non-traumatic running injuries stem from muscle tightness leading to restricted biomechanics and alterations in running gait. Dynamic stretches daily, even if you don’t run that day, are great for general strength, flexibility and stability. These include leg swings, lunges and squats. Even when brushing your teeth balance on one leg to improve core strength and stability. Use a foam roller regularly, and get regular massages if you can. Prioritise those especially tight “trigger points” to stay loose and supple. Keep moving during the day, stretch at your desk, and keep a tennis or golf ball in your draw and roll out the soles of your feet whilst working.